Can Prolotherapy help failed back surgery syndrome? In this article we will discuss Prolotherapy injections as a means of relieving pain and restoring stability in the spine of a patient who has been diagnosed with Failed Back Surgery Syndrome. In their researching of failed back surgery syndrome treatment options, these people, perhaps like youself, came upon an article like this one looking for an answer. Although someone’s back pain may be, or may not be as severe as it was before the surgery, many people will continue to experience significant back pain after spinal surgery. Why? Because the back surgery removed or stretched or injured supporting structures, such as the lamina, facet, or disc and the supporting soft tissue such as spinal ligaments. Prolotherapy as will be explained in this article is an injection therapy that seeks to stabilize the structures of the spine through healing soft tissue damage caused by the surgery or not fixed by the surgery. Spinal pain that occurs right after surgery can be from sensitized nerves. While chronic post-surgical spinal pain is often from spinal instability or tissue damage caused by the surgery or the post-surgical care. Enthesopothy – The enthesis is the point at which the connective tissue structures such as fascia, ligament, tendon, or muscle attach to the bone. The term enthesopathy typically refers to a degenerated enthesis; though when some doctors uses this term, they typically mean enthesitis (inflammation of the enthesis). Myofascial pain syndrome -muscle pain that is radiating or causing pain in seemingly unrelated parts of the bod. Since myofascial pain syndrome is caused by taut bands or trigger points in the muscles, treatments have included traditional physical therapy such as massage, ultrasound and stretching. Although these treatments provide relief, the results often diminish on the patient’s way home. The problem is that these efforts do not address weakened spinal ligaments or Enthesopothy. Neuralgia – Nerve pain – To do a surgical procedure, many superficial sensory nerves have to be cut in order to get down to the vertebrae, and sometimes these nerves get inflamed and/or compressed as they rebuild themselves. Generally, Lyftogt perineural injections and/ or hydrodissection works quickly to resolve this post-surgical neuritis. The treatment is done on or along the surgery site as well as on any chronic compression injuries that are found on physical examination. Generally, post-surgical treatments are given once/week until the symptoms are resolved. Most likely, four to eight sessions will be needed. All spinal surgeries alter spinal mechanics, causing more force to be generated at the areas surrounding the spinal surgical site. With spinal laminectomies and microdisectomies, it is at the same spinal level. With spinal fusions and disc replacements, it is at adjacent segments. Laminectomies may contribute to clinical instability through the removal of supporting structures of the spinal column. Laminectomy in the lower back, thoracic region or neck can cause or lead to spinal instability. The thoracic spine is especially vulnerable to clinical instability after a laminectomy, because it normally has a physiologic kyphosis (a curvature). Because of this normal curvature, the posterior ligaments are not as strong as other ligaments since the stability of the thoracic spine is partially derived from the rib cage. When the lamina (the bony plate of the vertebrae) is taken out, anterior forces prevail, making the thoracic kyphosis (curvature) and instability worse. Comprehensive Prolotherapy is very effective at treating post-surgical pain, including that which occurs from low back surgeries and laminectomies. What type of treatments are available for failed back surgery patients? A new paper in the medical journal Pain Physician makes it clear that there are not many traditional remedies for the patient who is worse off after back surgery. This is from the research as it appeared in the medical journal Pain Physician. It comes from medical university researchers in South Korea. “Failed back surgery syndrome is a frequently encountered disease entity following lumbar spinal surgery. Although many plausible reasons have been investigated, the exact pathophysiology remains unknown. Not been clearly determined is a non-committal way to say these treatments will not meet the patient’s expectations of pain relief. They do not work. Patients who suffer from failed back surgery syndrome are showing up in the offices and clinics of physicians, surgeons, and pain specialists in overwhelming numbers. As lumbar spinal fusion surgery continues to grow in prevalence, so will the number patients suffering from failed back surgery syndrome. It is important for physicians treating these patients to expand their knowledge of what causes failed back surgery syndrome so they can adequately be prepared to manage these complex cases in the future. pseudarthrosis (a bone fracture that can only be repaired by medical intervention). Certain diagnoses may be confirmed with diagnostic procedures such as intra-articular injections, medial branch blocks, or transforaminal nerve root blocks. Once a cause is determined, a multidisciplinary approach to treatment is most effective. Why does spinal surgery fail to relieve pain? There are many types of spinal surgery, each with its own success and failure rates. Korean and American doctors publishing in the publication Global Spine Journal found that patients who underwent surgery for lumbar stenosis symptoms, often show radiologic evidence of cervical and thoracic spinal stenosis. However the cervical and thoracic stenosis did not cause pain or other symptoms typical of stenosis. This is a classic example of surgery fixing one problem and causing a worse problem in another area of the spine. Non-surgical treatments for spinal instability should be explored in these patients. In a discectomy (removal of the disc), the surgeon must spread muscle and cut various ligaments in order to perform the surgery. The surgery itself can potentially lead to ligament laxity and spinal instability. Sometimes this leads to an “immediate failure,” of the back surgery. “Immediate failed back surgery syndrome following lumbar microdiscectomy is defined as persistence, deterioration or recurrence (during hospital stay) of radicular pain and/or sensorimotor deficits and/or sphincter dysfunction after microdiscectomy, which was uneventful from the surgeon’s perspective. Further removal of a disc or fusion at one level can lead to disc herniation at the same level or at different levels in the future. It is very common for doctors to see a patient with “one level fixed,” while another segment of the spine is now unstable, degenerated, and causing pain as noted in the above study. Another way surgery causes harm is that in a discectomy, a large portion of the disc remains behind. This is the portion that, if removed, will cause great risk to the patient. The remaining disc can be as much as 40% of the original disc and it can also re-herniate. Non-surgical treatments for spinal instability should be explored. What are disastrous results in failed back surgery patients? For patients, fixing one problem but causing the same problem to appear in another area of the spine can be seen as “disastrous results.” This is a term used by doctors in Mexico who investigated patients diagnosed with Failed Back Surgery Syndrome. The main reason for failed back surgery in the Stenosis group was was technical error during surgery (61.1%). Therefore the disastrous results could be seen arising from “surgical error,” and MRI misinterpretation. Research appearing in the journal, Seminars in Musculoskeletal Radiology, lists potential complications following spinal fusion which could confuse the interpretation of the MRI for doctors who are trying to see why the patient is suffering from post-surgical pain. The problem is MRI cannot tell what is causing the patient’s pain anatomically, it now has to look for suspect hardware. What if there is no suspect hardware? Diagnosis Failed Back Surgery Syndrome. Note that the above study cites 28% rate of post-surgical pain. The researchers also note that controversy exists over the best revision surgery for pain after surgery. Their conclusion is that surgeons may as well choose the least invasive surgery since there’s no one revision surgery that is better than the other. As mentioned above, surgery of any kind interferes can cause harm to soft tissue, revision surgery is likely not the best answer. Non-surgical treatments for spinal instability should be explored. If the MRI showed what was really causing the pain, the lumbar fusion would have worked! Here is a remarkable finding from research on lumbar fusion success or non-success. “Results following fusion for chronic low back pain are unpredictable and generally not very satisfying. The major reason is the absence of a detailed description of the symptoms of patients with pain, if present, in a motion segment of the spine. Various radiological findings have been attributed to discogenic pain, but if these radiological signs were really true signs of such pain, fusion would have been very successful. Patients should be informed that the likelihood of reoperation following a lumbar spine operation is substantial. Revision surgery is a treatment option, and a popular one. In 2007, doctors at the University of Washington published a heavily cited paper that has been referenced in more than 230 medical studies and countless articles, including this one. Most recently this research was cited in a July 2017 study from Rush University medical center doctor published in the journal Clinical Spine Surgery which examined the “unfortunate” circumstance of revision lumbar surgery. The need for revision of a lumbar fusion is an unfortunate occurrence, and there is little known about specific risk factors for morbidity and readmission after this procedure. The purpose of this study is to use a large, national sample to identify patient and operative factors that may contribute to the development of these adverse outcomes. severe symptomatic disease such as insulin-dependent diabetes. Research shows effective treatment options for failed back surgery syndrome beyond secondary revision procedures, narcotic medications, spinal cord stimulators. Long term Oxycodone – naloxone use? Spinal cord stimulation is usually reserved as a last-chance effort at controlling back pain. Specifically it is used for people what have pain after surgery, complex regional pain syndrome, or severe nerve pain and numbness. The procedure involves implanting a small pulse generator into the stomach and running coated wires to the spine to deliver electrical impulses to the spinal cord. These electrical impulses block pain signals traveling to the brain. In most patients we see, the spinal cord stimulator does not replace the need for narcotic medication. Additionally, a foreign device is placed in the body, which is nearly never the best option. There are risks to implanting a foreign device in the body. Some of these risks include infection, scar tissue around the stimulator, headaches, breakage of electrical wire, and pain beyond the reach of the impulses. Spinal cord stimulation for patients with failed back surgery syndrome show variable results and limited to moderate evidence. In the last years the stimulation of high frequency has been considered as a better alternative in this pathology for its supposed benefits compared to the stimulation with conventional frequency. One did not work better than the other. Seventeen pain centers across the United States took part in a study to see why spinal cord stimulations had to be removed from patients. In agreement from other studies, the pain centers found that clinically, spinal cord stimulation devices are cost effective and improve function as well as quality of life. 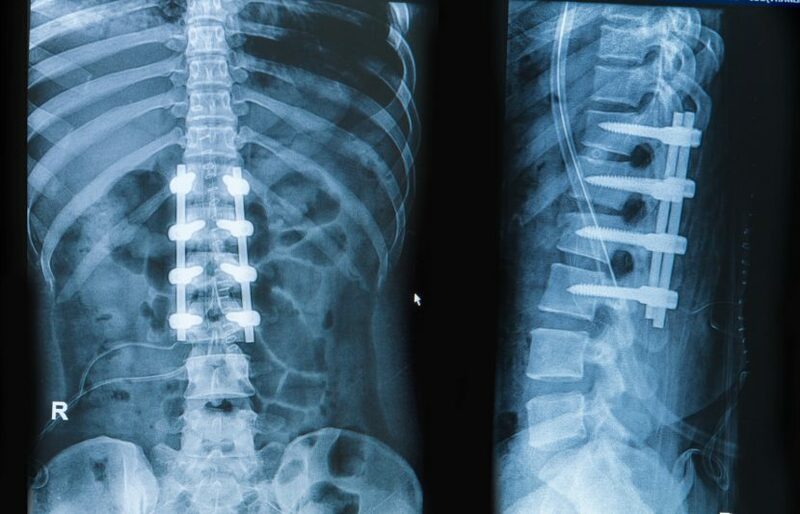 However, despite the demonstrated benefits of spinal cord stimulation, some patients have the device removed. The researchers in this study wanted to know why. Similar to a spinal cord stimulator, spinal drug delivery (or intrathecal drug delivery) involves implanting a small pump in the stomach and running a catheter to the spine to deliver pain medication. It is used for people with chronic back pain who need large doses of narcotics to deal with the pain. Compared to oral medication, this “pain pump” requires a smaller dose of narcotics because medication goes directly to the area of pain. Research in the medical journal Neuromodulation wrote of the benefits of intrathecal drug delivery. Researchers looked at patients who were averaged 67 years of age, was 68% women, and 77% were Medicare beneficiaries. Ninety-five percent of patients had low back pain, and 86% had limb pain. The majority (81%) had pain for more than 5 years. with 84% also reporting significant systemic opioid side-effects. In other words, just live with the pain. Mental strength can help, but the reality is that there is an underlying cause of the pain that needs to be addressed. So what are other options for pain after back surgery? As most people with post-surgical depression emerge from depression after about six months, many doctors consider post-surgical depression either benign or even helpful as it keeps people inactive. Nevertheless, researchers have discovered that depressed patients are more likely to have other complications following back surgery. They are less able to cooperate in their after-care, particularly in rehabilitative therapy. For people who have an existing history of depression and anxiety, recovery from post-surgical depression is neither guaranteed nor as straightforward as some surgeons expected. Comprehensive Prolotherapy is a treatment designed to strengthen weakened soft tissue in the spine and bring stability to the area through injections, not surgery. More stability, less unnatural movement, less pain. We recommend a consultation for those on narcotics and those with spinal cord stimulators. In the case of spinal stimulators, we ask patients to bring in their X-rays showing exactly where the spinal cord stimulator is placed. As long as we can see where the stimulator electrodes are located we can safely do Prolotherapy. Prolotherapy attacks the problems of a damaged spine instead of suppressing the symptoms. It offers a fix when all else fails. While Prolotherapy is an alternative to disc surgery, it can also help when disc surgery has already occurred yet failed to address the root issue. When you fuse two or three spinal segments together, mobility is lost. Spinal twisting and torque movement, however, have to come from somewhere. Where? The spinal segments above and below the fusion. These vertebral segments now have to move “excessively” to compensate. Ultimately, this extra movement and strain will cause accelerated degeneration of the disc, ligaments, and joints of these segments, thus making the person more prone to pain in these areas. This is most likely the explanation for the increased pain a few years down the road and the “need” for more operations later. In research from Harold Wilkinson MD, published in the medical journal Pain Physician, Dr. Wilkinson looked at difficult back pain cases: “Of the patients studied, 86% of patients had undergone prior lumbar spine surgery and all were referred for neurosurgical evaluation for possible surgery,” to see is simple dextrose Prolotherapy would be of benefit. Thirty of the 35 patients in this study had been referred to a neurosurgeon because of persistent pain and disability despite prior low back surgery and were referred for consideration for possible additional surgery. After inclusion in this study only four patients subsequently underwent additional surgery, though 29 patients requested repeat injections. Other Prolotherapy research (23,24,25) has shown Prolotherapy can stabilize the areas that are painful. For most cases three to eight visits of Prolotherapy, given once per month is all that is needed. Remember getting one spinal fusion operation may end up leading to another. Perhaps, a second opinion by a Prolotherapy doctor before getting a spinal fusion operation is needed? It may help you avoid surgery. 1 White AA, Panjabi Clinical Biomechanics of the Spine. 1978: JB Lippincott Company, Philadelphia. p.218. 2 Cho JH, Lee JH, Song KS, Hong JY, Joo YS, Lee DH, Hwang CJ, Lee CS. Treatment Outcomes for Patients with Failed Back Surgery. Pain physician. 2017;20(1):E29-43. 3 Hussain A, Erdek M. Interventional Pain Management for Failed Back Surgery Syndrome. Pain Pract. 2013 Feb 3. doi: 10.1111/papr.12035. 4. Park MS, Moon SH, Kim TH, Oh JK, Lyu HD, Lee JH, Riew KD. Asymptomatic stenosis in the cervical and thoracic spines of patients with symptomatic lumbar stenosis. Global spine journal. 2015 Oct;5(05):366-71. 5. Rohde V, Mielke D, Ryang Y, Gilsbach JM. The immediately failed lumbar disc surgery: incidence, aetiologies, imaging and management. Neurosurg Rev. 2014 Sep 23. 7. Rankine JJ. The postoperative spine. Seminars in Musculoskeletal Radiology. 2014 Jul;18(3):300-8. doi: 10.1055/s-0034-1375571. Epub 2014 Jun 4. 8. Lakkol S, Bhatia C, Taranu R, Pollock R, Hadgaonkar S, Krishna M. Efficacy of less invasive posterior lumbar interbody fusion as revision surgery for patients with recurrent symptoms after discectomy. J Bone Joint Surg Br. 2011 Nov;93(11):1518-23. 9. Nyström B.Spinal fusion in the treatment of chronic low back pain: rationale for improvement. Open Orthop J. 2012;6:478-81. 10. Martin BI, Mirza SK, Comstock BA, Gray DT, Kreuter W, Deyo RA. Reoperation rates following lumbar spine surgery and the influence of spinal fusion procedures. Spine. 2007 Feb 1;32(3):382-7. 11. Basques BA, Ibe I, Samuel AM, Lukasiewicz AM, Webb ML, Bohl DD, Grauer JN. Predicting postoperative morbidity and readmission for revision posterior lumbar fusion. Clinical spine surgery. 2017 Jul 1;30(6):E770-5. 12. Deyo RA, Martin BI, Kreuter W, Jarvik JG, Angier H, Mirza SK. Revision surgery following operations for lumbar stenosis. The Journal of bone and joint surgery. American volume. 2011 Nov 2;93(21):1979. 13. Bujedo BM. Treatment of Failed Back Surgery Syndrome in a Forty-Three-Year-Old Man With High-Dose Oxycodone/Naloxone. Anesthesiology and Pain Medicine. 2015;5(2):e21009. doi:10.5812/aapm.21009. 14. Jeon YH. Spinal cord stimulation in pain management: a review. Korean J Pain. 2012 Jul;25(3):143-50. Epub 2012 Jun 28. 15. Kapural L, Peterson E, Provenzano DA, Staats P. Clinical Evidence for Spinal Cord Stimulation for Failed Back Surgery Syndrome (FBSS): Systematic Review. Spine. 2017 Jul 15;42:S61-6. 16. De Andres J, Monsalve-Dolz V, Fabregat-Cid G, Villanueva-Perez V, Harutyunyan A, Asensio-Samper JM, Sanchis-Lopez N. Prospective, Randomized Blind Effect-on-Outcome Study of Conventional vs High-Frequency Spinal Cord Stimulation in Patients with Pain and Disability Due to Failed Back Surgery Syndrome. Pain Medicine. 2017 Dec 1;18(12):2401-21. 17. Pope JE, Deer TR, Falowski S, Provenzano D, Hanes M, Hayek SM, Amrani J, Carlson J, Skaribas I, Parchuri K, McRoberts WP. Multicenter Retrospective Study of Neurostimulation With Exit of Therapy by Explant. Neuromodulation: Technology at the Neural Interface. 2017 Jul 17. 18. Caraway D, Walker V, Becker L, Hinnenthal J. Successful discontinuation of systemic opioids after implantation of an intrathecal drug delivery system. Neuromodulation: Technology at the Neural Interface. 2015 Aug 1;18(6):508-16. 19. Morgalla M, Fortunato M, Azam A, Tatagiba M, Lepski G. High-Resolution Three-Dimensional Computed Tomography for Assessing Complications Related to Intrathecal Drug Delivery. Pain physician. 2016 Jul;19(5):E775-80. 20. Cramer H, Haller H, Lauche R, Dobos G. Mindfulness-based stress reduction for low back pain. A systematic review. BMC Complement 2012 Sep 25;12(1):162. 21. Sahin N, Karahan AY, Devrimsel G, Gezer IA. Comparison among pain, depression, and quality of life in cases with failed back surgery syndrome and non-specific chronic back pain. Journal of Physical Therapy Science. 2017;29(5):891-5. 22. Wilkinson HA. Injection therapy for enthesopathies causing axial spine pain and the “failed back syndrome”: a single blinded, randomized and cross-over study. Pain Physician. 2005 Apr;8(2):167-73. 23. Klein R, Dorman T, Johnson C. Proliferant injections for low back pain: histologic changes of injected ligaments and objective measurements of lumbar spinal mobility before and after treatment. J Neurologic and Orthopedic Medicine and Surgery. 1989;10:123-126. 24. Klein R, Eek B, DeLong B, Mooney V. A randomized double-blind trial of dextrose-glycerine-phenol injections for chronic, low back pain. J Spinal Disord. 1993;6:23-33. 25. Klein R, Eek B. Prolotherapy: an alternative approach to managing low back pain. J Musculoskeletal Medicine, 1997;May:45-49. 26. Elder BD, Holmes C, Goodwin CR, Lo SF, Puvanesarajah V, Kosztowski TA, Locke JE, Witham TF. A systematic assessment of the use of platelet-rich plasma in spinal fusion. Annals of biomedical engineering. 2015 May 1;43(5):1057-70. 27. Hussein M, Hussein T. Effect of autologous platelet leukocyte rich plasma injections on atrophied lumbar multifidus muscle in low back pain patients with monosegmental degenerative disc disease. SICOT-J. 2016;2:12. doi:10.1051/sicotj/2016002.